More good news for one of the HDW animals, Sunset, who was one of the two who travelled the length and breadth of the nation with nowhere to go. Fostered by our very own Vanessa and Nicole Vandemark here in Sedona, Sunset has had a rought time of it, not only being split from her family, but with dental issues causing her great pain and anxiety. 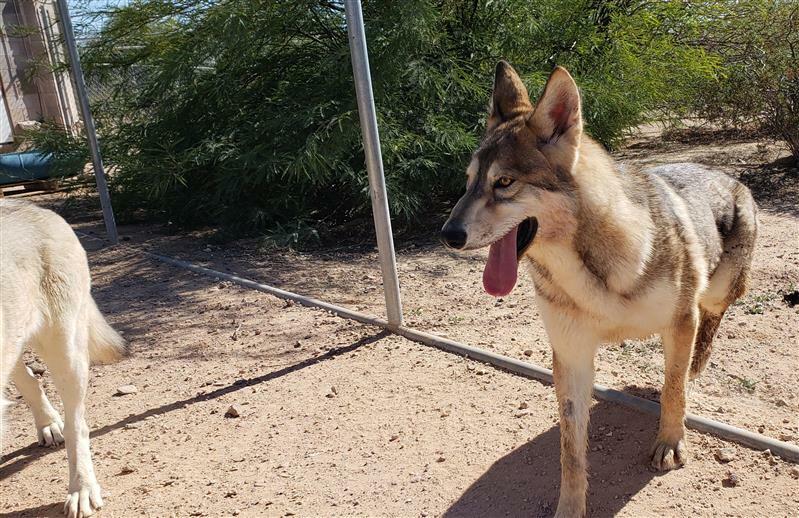 After surgery on Monday, where it was discovered that all her teeth were without roots and all removed, she set off with us to Eagle Tail Mountain Wolf Rescue to be reunited with her sister and others from the HDW pack. Eagle Tail had reached out to us following the Fox 10 News Item and essentially they have scooped up the remainder of the animals who needed to be taken. We were overjoyed to meet this amazing husband and wife team and see their incredible facility here in Arizona. Please give them your support and maybe go visit the animals to see them in their wonderful new surroundings.